The players are now bagging up their chips for the night. The clock says that there are 26 players remaining, but the final number, along with chip counts of advancing players will be posted within the hour. Players will soon head out on their last 15-minute break of the day. Upon return from the break they will play two more full levels before bagging and tagging for the evening. Day 2 resumes on Sunday at 11am, and anyone that doesnt make it through, has Flight B tomorrow, and up until the start of play on Sunday to enter/re-enter. Heidi Alexander-Allain leads the notable chip counts heading into the home stretch. 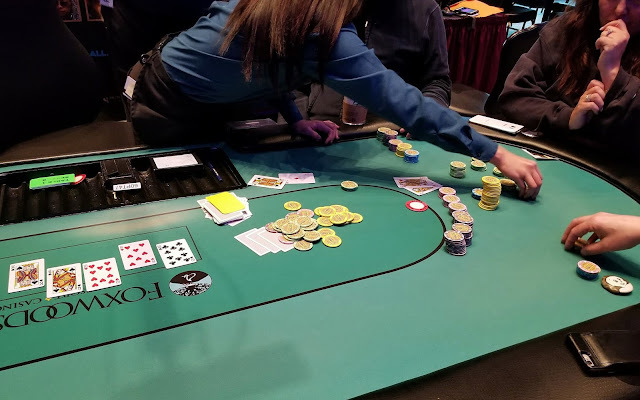 Alexander-Allain began her climb to the top just after the dinner break when she knocked out Rickey Lee with her full house vs. Lee's rivered Broadway straight. There is around 20,000 in the middle, and the board reads 10♣10♥8♠Q♠K♠. Rickey Lee bets 10,000, and Heidi Alexander-Allain moves all in. "Does she have me covered?" Lee asks. A few players at the table chime in, and Lee requests that the dealer count out the chips to be sure. The dealer counts down Alexander-Allain's chips, and tell's Lee the 53,000 total. Lee glances at his chips for about ten seconds, seeing he has less than his opponent, and calls. "Queens," a player at the table that's not involved in the hand hypothesizes. Alexander-Allain quickly turns over Q♥Q♦ for the full house. Lee turns over A♦J♠ for the inferior Broadway straight, and prepares to exit the tournament area. Alex Rocha raises to 1,200 in the cutoff, and Sam Taylor makes it 4,000 in the big blind. Rocha calls. The flop comes K♣K♠8♠. Taylor bets 4,000, and Rocha counts out his remaining chips, and calls the 4,000. Both players check the 9♣ turn. The river is the 7♠. This time Taylor checks, and Rocha bets 14,000, leaving himself only 4,000 behind. Taylor goes deep into the tank, and over three minutes pass before he apologizes to the table for taking so long. One of the players seated across from Taylor says, "Don't worry, take your time." Taylor thinks for over another full minute before moving the chips forward to call. "Full house," Rocha announces, as he turns over 8♦8♣. Taylor pauses for a few seconds before mucking his cards without showing. Michael Lavoie was just eliminated shortly after the dinner break. Lavoie moved all in on the button for 5,000, and the player in the big blind asked for the count. Upon hearing the total, and looking down at his chip stack, the player said, "Alright, I call," while shrugging his shoulders. "That's not what I wanted to see," the big blind says, seemingly referring to the shared nine, but the flop comes K♥7♣2♦ giving the player a pair to take the lead. Unfortunately for Lavoie, the 8♥ turn and 6♠ river do not improve his hand, and he is eliminated from play, with the option to re-enter. Players in Flight A of the $2,500 Championship event are now on a 60-minute dinner break. They will return around 5:45pm to play Level 7 with 250/500 blinds and a 50 ante. The players will play through level 10 before bagging up their chips for the night, and will return to play Day 2 on Sunday at 11am. There is a second starting flight tomorrow (Saturday March 24th) at 10am, and registration is open until the start of play on Day 2 (Sunday). Just moments before the start of the dinner break, Louis Scianna was eliminated by Mark Perry. Perry flopped a set of jacks and moved all in after he rivered a full house. (Scianna had rivered trip nines.) After a close count, Perry had Scianna slightly covered, and is heading into the dinner break with around 60,000. There's around 4,000 in the middle, and four players to see the A♥Q♣6♥ flop. Rickey Lee checks in the big blind, Omar Saeed checks in middle position, Gary Lucci checks in the cutoff, and the player on the button makes it 2,300. Only Saeed calls. Both players check the 10♦ turn. The river is the 8♥. Lee checks and Saeed announces that he is all in. Apparently, Saeed has been known to make large shoves in this event, because a player at the table mutters in frustration quietly, "Again?" Lee thinks for a few moments before ultimately opting to muck his hand. Curt Kohlberg is no stranger to the Foxwoods scene. Last year at this time, Kohlberg took down the $5,000 High Roller event, adding $31,331 to his impressive $3 million+ in live tournament earnings. Kohlberg's impressive resume is peppered with scores all over the world, but a close look reveals that it's fair to say he got his start here at Foxwoods casino. His earliest cash dates back to April of 1997, when he placed 7th in a $530 7-Card Stud event here at Foxwoods, and he immediately started running deep in every tournament he played thereafter. Kohlberg is in today's field hoping to add another large dollar amount by securing a piece of the $400,000 guaranteed prizepool.